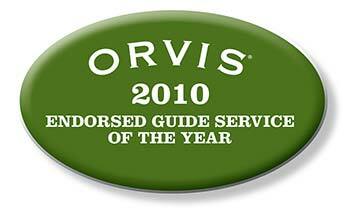 Hawkins Outfitters Orvis Endorsed Guide Service of the Year winner specializes in fly fishing Northern Michigan. Steelhead, trout, salmon, smallmouth, pike, muskie and carp are the focus. We practice strictly catch and release fishing. Fly Fishing opportunities are available year around in Northern Michigan. There are many fishing venues with opportunities for all ages. Want to learn how to fly fish, increase your skills or maybe teach your child? 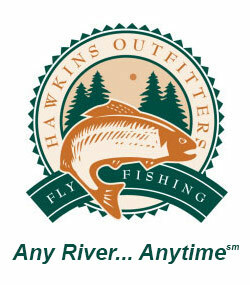 Hawkins Outfitters can help you do it. Give us a call 231-228-7135 to book your Guide Trip today. and insured to guide on the Manistee River, Pere Marquette, Pine, Boardman, and Ausable rivers in Northern Michigan. We also fish the Grand Traverse Bay and many inshore lakes. Due to these factors if you are vacationing or doing business in Northern Michigan we have opportunities near you. In addition to guiding fly anglers in Northern Michigan we book and guide trips in the fall for salmon and steelhead on the Garden River in Sault St Marie, Canada. Also in the winter months we book and host trips to Patagonia and Belize. I have traveled and fished extensively in both countries consequently we can help anglers have the best opportunities possible in these remote locations. 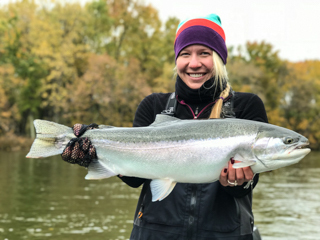 Fly fishing for Manistee River Steelhead is possible from September through April. March, April and September through December being prime time. All of our guides fish for steelhead more than 100 days a year. Therefore whether swinging a fly or dead drifting an egg pattern, we know where steelhead are. Brown and Brook trout are plentiful in Northern Michigan. Trout fishing is available in most of Michigan waters all year round. With miles of special regulation streams and great hatches as a result our trout fishing is wonderful. Our main hatches occur in May and June starting with Hendrickson’s, and culminating with Hex’s. July and August provide exciting grasshopper dry fly fishing during the day. At night waking mice for trophy trout is an experience you won’t forget. Being located in Northern Michigan near Traverse City, puts us near the center of much of the best fly fishing in the Midwest. It also provides a high quality environment when not on the water or for the non-anglers in your group. Traverse City boasts many fine restaurants, quality shopping, The National Cherry Festival, Traverse City Film Festival and Horse Show by the Bay. These are all nationally recognized events. 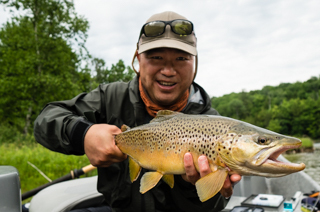 Fly Anglers based in or near Traverse City have diverse lodging options, hotels, motels and cabins are all available. Come join us on Any River…Anytime? *This institution is an equal opportunity provider and is operated under special use permit with the Huron Manistee National Forests.